When featuring our alumni, we like to collect the stories from Lancers across different decades and age groups. While Lancers was established to provide children in the city with a place to ride and experience the joy of horses, for many years we have also had adult riders. Nina de l’Etoile joined Lancers in 1989 when she was 20 years old. She grew up in Vermont and had some riding experience as a child from camps etc. At high school, she had a friend with a horse and his friend had another horse so for two years, they took the horses on trail rides through woods, trails, and the rural countryside. In 1989, Nina’s family moved to Halifax but she did not discover Lancers until her second year of university. She was walking somewhere downtown and saw riders in the old paddock across the street and was so excited to find a place where she could ride that was right down the road from her university. Nina then spent the next four years riding at Lancers with Mary Jopling as her main instructor. She began riding once a week and then moved up to two lessons a week and even did a few shows. While at Lancers, Fergut, one of the Russian horses, was Nina’s favourite. She said that he just had a cool look and came with a bit of a challenge. Nina enjoyed helping with fundraising and volunteered with the HATLR program for two years. 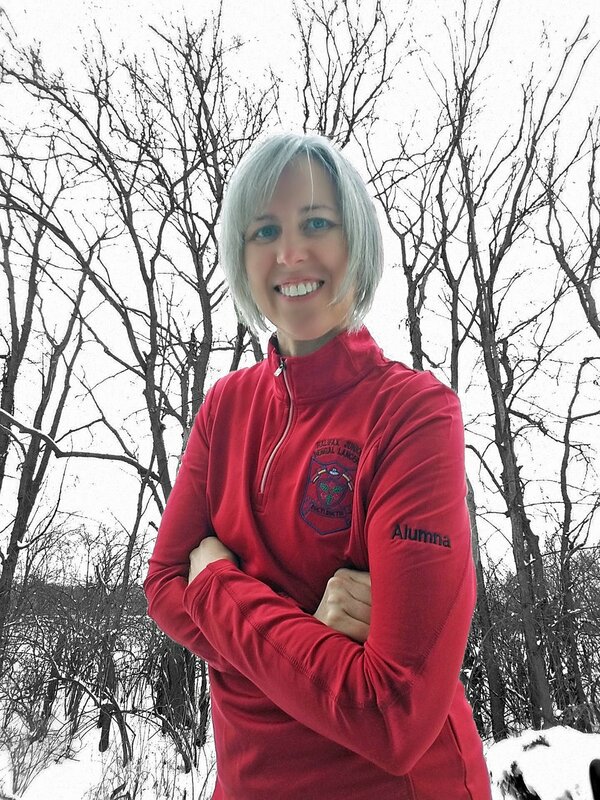 She even had her heart set on earning her CANTRA certification. Many of her favourite Lancer memories came from volunteering with HALTR. She recalled one boy with cerebral palsy and after riding, he would get off the horse and be so much more limber. She also recalled a man who had recently had a rock climbing accident and riding was incredible because it gave him freedom and independence. Nina later moved away from Nova Scotia but returned in 2002 and did an adult summer program at Lancers. She then moved to Ontario and owned a Morgan and competed in some Ontario Morgan horse club shows. Nina eventually moved to the States where she still lives. In fact, it was from the states that Nina contacted us asking if we had any Lancer alumni clothing she could order. She had found out about our summer quarantine and then saw our GoFundMe. Both her and her mum donated because she just felt “Lancers can’t close! It just can’t happen”! We were very happy to have Nina reconnect and order one of our Lancer shirts. In fact, she was our very first alumni to order a piece of alumni clothing. She proudly had Aluma embroidered on the arm! She decided to put alumna instead of her name so that people knew that Lancers was a club and she was a past member. The fact that Nina felt compelled to reach out and also to order a Lancer shirt speaks to her fondness of her time here. Of the importance of Lancers to her, she noted: “most of my riding experience as a kid or teenager was at day camps or free riding. Lancers was a lot more professional and organised. There were actual lesson plans and things were taught in steps and stages like grooming and tacking, and horsemanship, caring, lead changes etc. The horsemanship part of it was game-changing and it gave me confidence for me to own my own horse. It helped me fulfill my dream of owning a horse as I was really scared to own a horse before my time at Lancers”. Another legacy of Lancers was that it gave her the confidence to work with large animals. Nina made that into a profession and her current position is Butterflies and Animal Care Co-ordinator (with a live butterfly display in the summer) at Franklin Park Conservatory and Botanical Gardens in Columbus, Ohio. She works with the resident macaws. Finally, we asked Nina what being a Lancer means to her. She replied, “it was a really nice sense of community and I met a lot of great people. I don’t know anybody now but I know I can knock on the door and say I used to ride here and will be welcomed in. It is a feel-good place”. Indeed, we were very happy when Nina did, during a visit to Halifax from the states, stop in to visit the stables again! She was welcomed back and just as she always will be! Nina, we can’t wait for you to visit again and hopefully one day you can make it to our Christmas alumni ride! Thank you for your support during our summer!